It is with great sorrow that the Armenian Youth Federation of the Western United States mourns the loss of a dedicated ARF member, Hratch Mouradian, who was assassinated on April 2, 2013, in a premeditated and planned act of murder. Members of the Armenian Youth Federation and participants of the AYF Youth Corps program have had the pleasure of working with Hratch Mouradian on a day camp in the village of Proshian for the last three years. Hrach Mouradian was born on July 1, 1963 in Proshian and received his education at the Mesrob Marshdots University in Yerevan. Hrach dedicated his life to the independence of Artsakh from the fist days of the liberation movement. After the war, Hrach continued to serve his country and dedicated his career to becoming a community leader in Proshian. 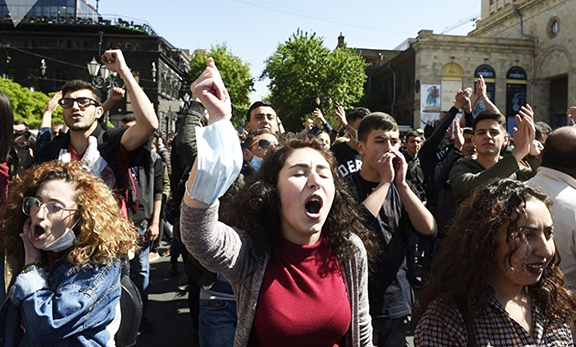 This tragedy has resonated with the members of the Armenian Youth Federation and has shocked the entire Armenian population, within both the homeland and the diaspora. The Armenian Youth Federation recognizes the gravity of this saddening incident, and extends its deepest condolences to the Mouradian family, the citizens of Proshian, and the Armenian Revolutionary Federation. The AYF calls for a transparent investigation of this assassination, as well as the prosecution of responsible parties on all levels. We resolutely stand with the people of Proshian and recommit to the work we have started within this community. a dose of tashnag justice is whats required. i despise the republican party and their thugs and criminals. Do not expect any justice from this corrupt regime,as they are a bunch of criminals. RPA party of serzh has become the nest of all criminality where criminal acts are planned and executed from there. serzh is on top of that criminal pyramid. Enough is enough, the thugs in Yerevan must pay, evbery single politician in Yerevan is tainted and corrupt, if our Hayrenik is to prosper and move forward we must clean the soviet era thugs once and for all otherwise our republic is doomed. The average Armenian citizen lives below poverty line, while every family member , body guard and friend of the current controlling families who also control government live a life of luxury, and then we critizise Azerbaijan, we are no better and unless something is done urgently in 20 years time the turks will simply walk in, or a major reveloution will occur to clean these keghdot traitors from our ruling parties and allow Armenia to be ruled by true Armenians. Astavats Mer Hratchin Hogin Lousavoreh, this will not be forgotton, pay back will come in many forms that is 100% guranteed. Tashnag style justice sounds good , lets see how the criminals face up !